The Dead Walk…again. The Dead Walk is the most popular of Breaking Fate Publishing’s releases and we look forward to the next release. 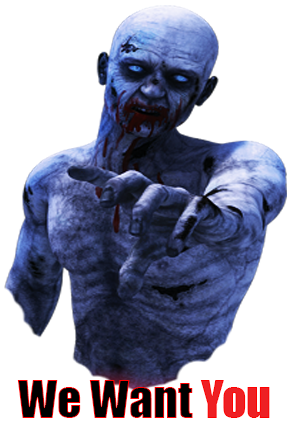 For our DW3 anthology we are seeking works of zombie fiction. Let the bullets fly and the limbs get chopped off. We love it all and can not wait until this next release. Length: no length limits. Send us yer epics! We do not accept queries. Please submit a complete manuscript. (Manuscript should be submitted as a .doc, .docx, .txt, or .rtf file.) Fiction and nonfiction manuscripts should include an exact word count; poetry manuscripts should include an exact line count. Include full contact information: phone, email, and mailing address. The anthology editor makes a final decision on whether to reject or accept the manuscript. For manuscripts that show some promise but need further development, the editor may write the author to request revisions on speculation. Once the manuscript is edited, it will be kept on file to be used for an upcoming anthology. It can take up to 6–8 months before a manuscript is published. Previously published work is acceptable as long as author has rights for work to be reprinted. BFP does not require exclusive rights for publication.